Music has been a part of human existence throughout history, but digital technology has made it accessible 24/7. The equipment for listening to digital recordings anywhere, anytime just keeps getting better -- and, more to the point for this story, it makes a killer holiday gift. Whether you're looking for speakers, headphones or earbuds -- and whether you can shoot for the moon or need to keep costs under $50 -- we have gift suggestions that will make your audiophile friends and family members happy through the holiday season and beyond. This is just the beginning of Computerworld's holiday gift guide: Check back each week this month for more great tech gift ideas, including smartphones, tablets, an array of gadgets and gear, and of course stocking stuffers. Bluetooth speakers tend to get a bad rap -- the argument being that a small, brick-like box can't possibly produce the big sound needed to fill a room (especially a large, noisy one filled with partygoers). And if you want true stereo, forget it: A single, self-contained speaker can only simulate it at best. 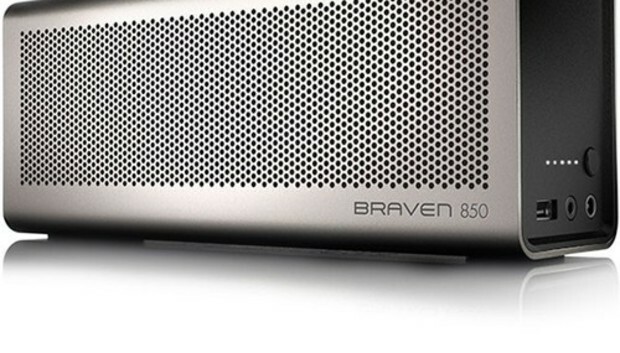 The Braven 850 speaker performs two impressive tricks that defy such low expectations. First, it has no problem getting loud -- way louder than you might think, given its fairly compact frame. Second, it can pair with a second Braven 850 for honest-to-goodness stereo sound. It's not an inexpensive solution, but it is a highly desirable one. The Braven measures 9.5 x 4 x 2.8 in., about the same size as Jawbone's better-known Big Jambox. But this speaker looks and feels a lot more substantial thanks to its aluminum casing and attractive industrial design. At around 3.4 lb., it also has a pleasant heft. Much of its weight comes from the 8,800mAh battery, which is good for up to 20 hours of playtime. That means the Braven's battery will probably last longer than your smartphone's -- so you can use the speaker's built-in USB port to juice up your phone (or tablet) for more music streaming. There are also handy top-mounted playback control buttons, a line-in jack for connecting non-Bluetooth music players, and a speakerphone option for making conference-room calls. But the important thing is that the Braven sounds superb, much bigger and warmer than its size would suggest. And if you pair it with a second, you've got a portable audio solution that rivals a standalone home stereo. You might also like: Sonos has always been synonymous with "expensive," but the Sonos Play:1 speaker lets you get started with the home-audio system for $199 direct. It's available in black and white versions. Budget speakers tend to have budget features, to say nothing of budget sound. Not so the Panasonic SC-NT10D, which not only produces robust sound, but also offers a ruggedized design and several features you wouldn't expect from a $100 speaker. First and foremost, it's waterproof, or at least splash-proof, meaning it's a fine choice to sit beside the pool or the bathtub. It can stand up to more than water, too: Panasonic engineered the SC-NT10D to be dust-proof, shock-proof and freeze-proof -- handy for the beach, the shop and even the skating rink. The disk-shaped speaker resembles an oversize hockey puck, or perhaps a miniature Roomba floor vac. Either way, its black-with-orange-accents design catches the eye. The micro USB charging port and 3.5mm AUX jack both stay protected thanks to rubberized snap-shut covers. The SC-NT10D sports clearly labeled and easily accessible buttons for power and volume; another button does triple duty as a control for play/pause, Bluetooth pairing and picking up calls. (The speaker pulls double duty as a speakerphone.) The unit doesn't have shuttle/track-skip buttons, but a big orange "Boost" button promises to hike the midrange audio presence -- a rather gimmicky feature (because shouldn't the audio always be at its best?). In addition to Bluetooth, the SC-NT10D supports Near-Field Communication (NFC), which makes for even easier pairing with phones that support NFC: Just tapping the phone on the top of the speaker and gets it set to start streaming audio. Panasonic promises up to eight hours of audio from the speaker's rechargeable battery. And thanks to the included AC charger, you won't have to seek out your computer's USB port every time you need to recharge -- though you certainly have that option. If you place the SC-NT10D on a wood surface, an internal passive radiator will help boost the lower end of the audio range, effectively giving you deeper, warmer sounds. Not bad for a speaker that's nearly small enough to slip into a pocket. You might also like: The Phoenix 2 ($80) from Beacon looks like a little subwoofer, which is fitting -- it packs one in alongside its two speakers. Available in four stylish colors, the Phoenix projects a 360-degree cone of sound and includes a microphone for making phone calls. The Francois et Mimi Trois Plus is a weird-looking little orb with a weird-sounding name sold exclusively via Amazon by a weirdly named company: Luzy's Storage Place. So why is it in our gift guide? Because this weird-looking little orb is actually a Bluetooth speaker that sounds surprisingly decent given its size. In fact, it's actually kind of cool and futuristic -- especially the black-and-red model. In case you're wondering, Francois et Mimi is a French supplier of housewares, jewelry and electronic goodies. For whatever reason, Luzy's Storage Place seems to be the exclusive U.S. reseller of the Trois Plus speaker. And the price often varies from one week to the next. At this writing, it's listed for $25, though it's been spotted for as low as $20 and as high as $30. Just make sure that you choose the 4.0 model, as there are still some 3.0 versions floating around on that Amazon product page. (If you click between the various color selections, you may see the latter.) With 4.0, you not only get the Bluetooth 4.0 spec, but also physical playback controls on the backside of the speaker. The latter is a minor amenity, but well worth having. Like all good Bluetooth speakers, this one doubles as a speakerphone (thanks to a built-in microphone) and includes a line-in jack for connecting non-Bluetooth music players. If you check the dozens of Amazon user reviews, you'll see that the majority of Trois Plus buyers praise its impressive sound, stylish looks and low price. Sounds like a winning combination. You might also like: Got a friend who loves to let his Android flag fly? The GOgroove Pal Bot ($30) offers portable, rechargeable wired audio in the shape of the Android mascot whose eyes glow blue or purple to indicate its power level. There are many small, inexpensive Bluetooth speakers out there -- but how many are water-resistant, use a suction cup to stick to a variety of surfaces and resemble a colorful mushroom? AudioSource's Sound pOp is encased in silicone rubber so you can use it in the shower or poolside. Raised buttons allow you to adjust the volume and to use it as a speakerphone, while an LED glows red when it's got enough charge and blinks white when it needs to be connected to a USB port for some additional juice. According to the company, it offers up to 8 hours of playing time on a charge. It comes in a variety of colors, including white, bubble gum (pink), black, navy, red and royal (purple). For such a low-cost speaker, the Sound pOp offers fine audio quality. While it has the initial underlying hum that almost all under-$50 Bluetooth speakers suffer from, it disappears quickly. And it's not bad as a speakerphone, either; during testing, somebody called me during a music session and said that my voice was a bit too loud -- the first time I've heard that complaint about one of these small devices. Finally, while the speaker's suction cup may not be foolproof, the rubber exterior does protect it nicely. The review unit has hit the floor a couple of times (once when it lost suction and once when it was accidentally knocked off a desk). It was also left at an open window during a rainstorm and got liberally splattered. It continues to play, unfazed. In other words, the Sound pOp could be the perfect gift for somebody who likes singing in the rain. When it comes to tech, most people treat their eyes before their ears: high-resolution laptops, high-resolution televisions, high-resolution tablets. But if you have friends or family members who prize sound as much as they do pixels, you might want to consider some high-end headphones as holiday gifts. They don't come much higher-end than the Bowers & Wilkins P7 mobile Hi-Fi headphones, a luxurious over-the-ear pair of cans that are equally well suited to travel and home listening. The P7 mixes an aluminum frame with plush leather ear cups and headband, resulting in a look that exudes, well, wealth. It relies on a detachable 3.5mm cable, and Bowers & Wilkins supplies two of them: one standard and one with an inline microphone and play/pause/volume controls for iOS devices. There's also a 1/4-in. plug adapter for use with a more traditional home stereo. For the road, the P7 can fold up for easier transport; an included leather carrying case makes for easy stowing in a carry-on. Obviously, if you're going to spend $400 on a pair of headphones, they should sound amazing. User and professional reviews reveal glowing praise for the P7, both its sound quality and its comfort. For the price, it would be nice if the P7 could cut the cord and offer Bluetooth- or NFC-powered wireless listening. That being said, if this is the year you decide to treat an audiophile friend to a pair of great headphones, you're sure to make her mighty happy with this. You might also like: Though it lacks a detachable cable, the lush-looking Beats Studio headphone set offers studio-quality sound and active noise cancellation that lasts for a whopping 20 hours between charges. At $300, it's also a bit easier on your wallet. Most audiophiles will tell you that speakers encased in wood cabinets have a much warmer sound than those built with plastic. But does the same principle apply to headphones? Griffin Technology answers the question with the WoodTones, an over-the-ear set of headphones with a choice of ear cup styles -- all of them wooden. That's no surprise given the product name, though Griffin could have easily cashed in on the current trend with a faux-wood veneer made of plastic. Instead, the WoodTones come in actual beech, sapele and walnut, ranging in color from light to dark. Like more expensive headphones, the WoodTones employ a detachable cable, an important option should you ever need to replace it: Instead of having to get a whole new pair of headphones, you merely get a new cable -- a fix that costs quite a bit less. And for iOS users, the cable offers a microphone and remote, though the latter includes only play/pause and shuttle buttons, not volume. If there's a common thread among most coverage of the WoodTones, it's great sound coupled with comfortable fit. Reviewers particularly admired the headphones' warm tones and impressive low end, making them a solid choice for anyone who likes their tunes with extra thump. Griffin doesn't supply a carrying case, which is understandable given that these aren't folding headphones. What's more, at $100 they're priced less than a lot of other premium over-the-ear models. If wood is your giftee's thing, the WoodTones deliver the dual benefits of style and warm sound for a reasonable price. You might also like: Though it lacks a detachable cable, the Sennheiser HD 280 Pro delivers studio-quality (and DJ-minded) audio for the same price as the WoodTones: $100. For plane or train travel, nothing beats the combination of portability and engine-noise-blocking power that a good set of earbuds provides. Some would argue that earbuds also sound more "immediate" than over-the-ear headphones, too, with tunes arriving right inside the wearer's ear canals. At the high end of the quality spectrum, the Bose QuietComfort 20 and 20i earbuds combine a noise-isolating in-ear fit with sophisticated noise-cancellation circuitry, which should make plane or train trips sound more like a gentle highway ride. And the Aware Mode allows some sounds, such as gate announcements at the airport, to come through while still providing a measure of noise cancellation. The QuietComfort 20 works with Android, BlackBerry and Windows Phone devices; it includes a microphone along with inline buttons for Aware Mode and call answer/end. The 20i was designed for iPhones, iPads and iPods, and features a four-button inline remote that adds volume and playback controls, along with voice commands. Both have a control module that turns noise cancelling on and off. The QuietComfort can last for up to 16 hours on a single charge, according to Bose, and a full charge (via the included USB cable) takes just two hours. By most accounts, Bose has engineered some of the best noise-cancellation circuitry to date and squeezed it into a comfy set of earbuds. This is one gift that's sure to please anyone who wants to hear their music and nothing more. You might also like: If you've got a professional musician on your gift list (and a healthy bank account), you may want to consider Shure's SE846 sound-isolating earbuds. For $999, they offer customizable frequency response, detachable cables, and components that can be switched depending on the type of "sound signature" your giftee is looking for. Want to know what all the kids are wearing nowadays? Well, yeah, denim and ironic t-shirts. But aside from that, they're wearing Skullycandy's Ink'd 2 earbuds, for two simple reasons: They look cool and they're cheap. Also, they sound great. Let's start with color -- or rather, colors plural: Skullcandy offers the Ink'd 2 in 24 different combinations, including green/black, black/white, black/red, Rasta, Yankees, Celtics and so on. Some versions -- those priced at $21 or $25 -- have an inline microphone with remote, while the $16 Ink'd 2s do without. But all models come with three sets of silicone gel earbud sleeves so you get the best possible fit (and best possible noise isolation), along with a flattened cable that, according to Skullcandy, offers improved durability. If nothing else, it looks niftier than the standard rounded wire. As for performance, one needs look no further than the hundreds of user reviews on Amazon and Skullcandy's own site. Almost without exception, they average out to between four and five stars. Needless to say, these earbuds are a popular choice -- not to mention an excellent gift, offering great sound, loads of color choices and almost unbeatable prices.